Six hospitality trainees of Le Tonlé arrived Kratie on 31 January 2015 to practices their skills at Le Tonlé guesthouse and restaurant in Kratie. After four months of training at Le Tonlé Stung Treng, the first six trainees comprise of three females and three males came to Kratie on 31st January for the purpose of practicing their hospitality skills. On the next day, trainees and staffs of were introduced to know each other. The six trainees are assigned to work in partners. A pair of trainees is assigned with specific tasks which they can know clearly what they are expected to do. There are four main areas that the trainees are placed in. Those include housekeeping, cooking, food and beverage, catering services and front office operation. Each week, a pair of trainees is assigned to be responsible for one task and by rotating them, all pairs of trainees will do the four main tasks equally. Training in Kratie was under the supervision of all Tonlé Kratie staffs with little assistant from operation manager. 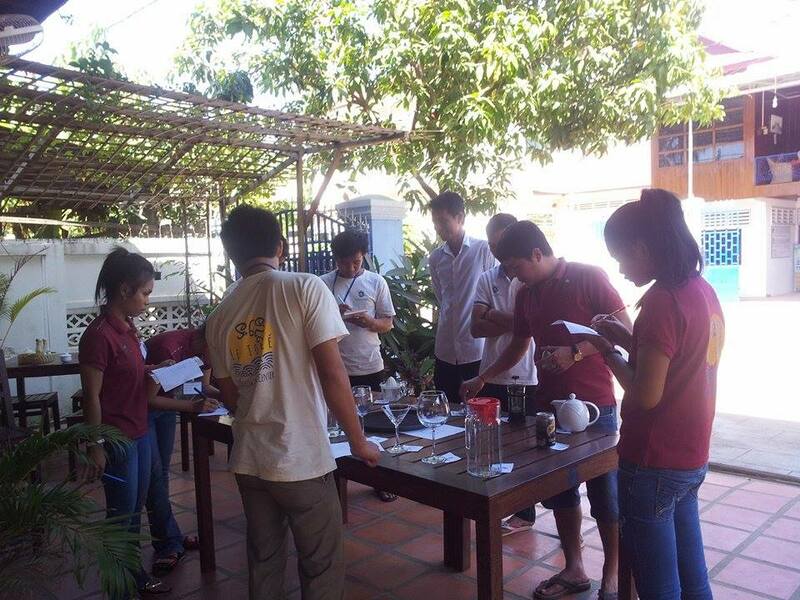 On the first day of training, 02nd February, two identification tests (ID tests) were carried out for beverage preparation and cooking classes. A set of materials used in beverage preparation were placed on the table and each trainee with a piece of paper was asked to come to have a look at the materials displayed and write down the names of items and their usages on the paper. The ID test was also conducted for cooking class. ID test is believe to help trainees identified items their usages and remember them well. “It’s the first time that I do this ID test, after the test, I can remember the materials and their usage around 80%. I was surprise to do it”. Said Pisey, one of our trainees. Here in Kratie, trainees have chance to put themselves in the real working environment and help to broaden their skills and knowledge. Sok Ai, one of our female trainees mentioned that “I am happy to be here at Le Tonlé Kratie as I can learn both theories and practicing with tourists. I am happy to communicate with tourist while improving my English language and hospitality skills”. All the six trainees placed at Le Tonlé Kratie are expected to have their hospitality skills improved after one month here. By delivering of both in-class training and real practical works, they will be able to help reduce the workloads of the staffs while develop their own competency as well. The next six trainees will arrive on 01st of March, 2015 and the rotation keeps going until July 2015.